Amanda D. Maynard, DO Internist at Ohio Health has been recognized as a “Leader in Medicine” among “America’s Best Doctors” for 2017. Dr. Maynard will be sharing her knowledge and expertise on Internal Medicine, Adult Medicine, Pulmonary Medicine and Osteopathic Manipulation. With experience in the field of Internal Medicine, Dr. Maynard offers valuable insight in her role as Internist at Ohio Health. Established in Ohio in 1891, Ohio Health is a non-for-profit, faith-based hospitals and healthcare organization. Focused on the improvement of the community through the delivery of quality, convenient, and timely healthcare, Ohio Health was named to the 2013 top hospital list from the Leapfrog Group. Board Certified by the American Osteopathic Board of Internal Medicine, Dr. Maynard’s day-to-day responsibilities include chronic acute care for patients age 16 and up tackling hypertension, diabetes, asthma/chronic obstructive pulmonary disease and osteopathic medicine. Maintaining consecutive recognition as the Best Doctors in America for 2015 and 2016, Dr. Maynard has completed a fellowship with the American College of Physicians, and has served as a Clinical Assistant Professor at Heritage College of Osteopathic Medicine – Ohio University. 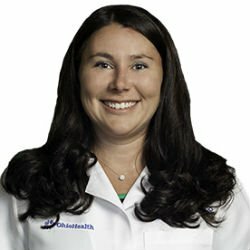 Following graduation with her medical degree from West Virginia School of Osteopathic Medicine in 2007, Dr. Maynard completed an internship in 2008 and residency in Internal Medicine at Doctors Hospital in 2010. Dr. Maynard maintains membership with the American College of Physicians, The American Osteopathic Association, The Ohio Osteopathic Association, The American College of Osteopathic Internists, and The American Board of Osteopathic Internal Medicine. Looking back, Dr. Maynard attributes her success to her dedication, strong work ethic, and the support from her parents who helped her to be involved in the medical field at a young age. Dr. Maynard chose the field of Internal Medicine after working at the front desk of a hospital in high school and later becoming an ER technician. In her free time, Dr. Maynard enjoys running marathons, horseback riding, paddle boarding, boating and spending time with her husband and two English Bulldogs (Gus and Lula). Considering the future, Dr. Maynard hopes to do administrative work for Ohio Health, to help make changes to the VA hospitals, and to provide better healthcare and access to veterans. OhioHealth is a family of not-for-profit, faith-based hospitals and healthcare organizations who have been serving patients in central Ohio since 1891. As WE grow, so does our belief that people come first. That every patient, no matter who they are and no matter which of our many hospitals or healthcare services they choose, deserves the very best care. WE make this happen by providing that expert, individualized care and sharing the latest knowledge and innovations across the entire OhioHealth system. WE are united. WE are strong. And WE are always moving forward. Join us, and see the difference WE can make. At OhioHealth, we recognize that the current healthcare environment is changing, and we know that to be successful we need to be the value delivery leader in central Ohio and the surrounding region.